Josip Manolić (pronounced [jǒsip mǎnolit͡ɕ]; born 22 March 1920) is a Croatian politician and former high-ranking official of the State Security Administration (UDBA or UDSA) who was the Prime Minister of Croatia from 24 August 1990 to 17 July 1991. Croatia formally declared independence during his term on 25 June 1991. Having taken office as Prime Minister at the age of 70 and having left the office at the age of 71, he is the oldest person to date to have served as Prime Minister of Croatia. 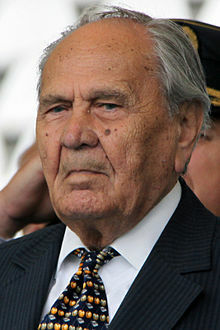 Manolić is also the oldest currently living former prime minister at the age of 99 years, 30 days and the longest-lived holder of the office. Following his brief term as Prime Minister, he served as the first Speaker of the Chamber of Counties, the upper house of the Croatian Parliament, from 1993 until 1994. Manolić was born in Kalinovac near Đurđevac. When he was 18, he joined the League of Communist Youth of Yugoslavia (SKOJ). He was vice president of the Association of Workers' Unions (URS) for the tanning industry. He was accepted into the Communist Party of Yugoslavia when he was 19. In 1940 he was appointed Secretary of the Municipal Committee of SKOJ for Nova Gradiška and was named member of the Regional Committee of the Communist Party. After the outbreak of the World War II in Yugoslavia, Manolić was involved in illegal party activity in Nova Gradiška. He was arrested by the Ustaše authorities in May 1941, along with twelve members of the Communist Party and SKOJ, for multiplying and sharing the Communist Party leaflets. At first, he was imprisoned in Nova Gradiška, but was later transferred to Slavonska Požega. Two of the party members were sentenced to death, but were later pardoned and their sentences were reduced to two and three years in prison. The rest were released. After his release, Manolić went to Zagreb, where he agitated for the Yugoslav Partisans. He remained in Zagreb until October 1942, when he moved to the territory under the partisan control. As a party agitator, he traveled across Croatia. With dismissal of Andrija Hebrang in 1944, the whole leadership of SKOJ was dismissed as well, including Manolić, who was Organisational Secretary. After his dismissal, the Party sent him to Bjelovar. In March 1944, Manolić became Member of the Municipal Committee of the Communist Party for Bjelovar, and was later named Organisational Secretary. In October 1944, he was named Director of OZNA 2 in Bjelovar, the communist police founded in May 1944. OZNA 2's jurisdiction were internal affairs, while OZNA 1's jurisdiction was external security and OZNA 3 served within the military. Under the pressure from the Armed Forces of the Independent State of Croatia, Yugoslav Partisans left Bjelovar, and returned again on 5 May 1945. His duty, from that point, was, as Manolić said, to "clear the terrain from the remaining Ustaše and adversary occupational forces". His jurisdiction was Municipality of Bjelovar, which then included Koprivnica, Križevci, Đurđevac, Vrbovec, Čazma and Ivanić-Grad. After the war, in Spring 1946, Manolić was dismissed as Chief of OZNA 2 for Bjelovar, and in Autumn of the same year, he was sent to education at the Military-Political School in Belgrade. The school was organised by the Soviet model, and was part of the educational system of the Yugoslav People's Army. At the end of 1947, Manolić returned to Zagreb, and was named Chief of the Department for Staff of the State Security Administration of PR Croatia. On 1 August 1948, Manolić was named Chief of Department for Execution of Criminal Sentences of the Secretariat of Internal Affairs in Zagreb. During that time, he imprisoned Archbishop of Zagreb Aloysius Stepinac. In 1948 he became a chief for prisons for political prisoners and remained in this office until 1963. In 1960, Manolić gained a law degree from the Faculty of Law, University of Zagreb. In 1965 he was elected to the Parliament of the Socialist Republic of Croatia. As a Member of Parliament, Manolić was Member of the Constitutional Commission, President of the Legislative-Legal Commission and President of the Organisational-Political Committee. He was reelected as an MP in 1965. In the aftermath of the Croatian Spring in 1972, Manolić was relieved of all duties and sent into retirement. He was one of the founders of the Croatian Democratic Union (HDZ), participating at its Founding Assembly in Jarun, Zagreb. Manolić was Franjo Tuđman's closest associates. Soon, he was named Vice President of the Presidency of the SR Croatia. Between 24 August 1990 and 17 July 1991, he was Prime Minister of Croatia, having succeeded Stjepan Mesić in the post. His Chief of Staff was Tomislav Karamarko, the future chairman of the HDZ and Deputy Prime Minister under Tihomir Orešković. On 25 June 1991, the Croatian Parliament voted for Croatia to secede from SFR Yugoslavia and declared it an independent country. Manolić was succeeded by Franjo Gregurić in July 1991. When Manolić left the office on 17 July 1991 Croatian forces — police and nascent military — were involved in full-scale war with Krajina rebels, who were backed by the Yugoslav federal army. He took another, even more important post as the head of Constitutional Order Protection Office (Ured za zaštitu ustavnog poretka), a body that would coordinate and supervise all Croatian security services. There he built Tuđman's security apparatus, relying mostly on the old cadre from UDBA and other sections of the Communist-era security apparatus. Despite the nature of his work, he remained very much in the public spotlight. In his interviews and statements he gradually gained a reputation of being a moderate. His enormous power, moderate views and Partisan past made him very unpopular among the rank and file of the HDZ party and brought him into conflict with Gojko Šušak, the powerful minister of defence who led a hardline nationalist faction. In 1993 Manolić was replaced from his post and elected as Speaker of the Chamber of Counties of Croatia (to 1994). Many saw this as his demotion and fall from Tuđman's favor. One year later Manolić and Mesić tried to organise a mass defection of HDZ members of Sabor and thus deprive Franjo Tuđman of parliamentary majority. They failed and later, together with other HDZ dissidents, created a new party called Croatian Independent Democrats (HND), of which Manolić was the president in 1995. Manolić's attempt to take power on national level failed, but his supporters in the Zagreb County Assembly succeeded in replacing HDZ administration. This led Tuđman to introduce new legislation, merging Zagreb County and the City of Zagreb and calling for new elections, which ultimately resulted in the Zagreb Crisis. Those elections coincided with the 1995 parliamentary elections, during which HND fared badly, failing to enter Sabor. Since that time, Manolić has been retired from active politics. His autobiography, Politika i domovina – Moja borba za suverenu i socijalnu Hrvatsku, was published in 2015. In 1945, Manolić married his first wife, Marija Eker (1921 – 15 April 2003). On 30 April 2016, Manolić married his second wife, Mirjana Ribarić (born 5 March 1956), who is 36 years his junior. ^ "Executive Power:President of the Republic". Homepage of the Republic of Croatia. Croatian Academic and Research Network. Retrieved 19 July 2010. ^ "Druga vlada" (in Croatian). Croatian Information-Documentation Referral Agency. Archived from the original on 8 July 2012. Retrieved 10 December 2010. ^ a b c d e f g h i j k "Josip Manolić". vecernji.hr (in Croatian). Retrieved 17 July 2016. This page was last edited on 25 March 2019, at 01:39 (UTC).